Some people have a gift for expressing the sentiments of many in an individual manner. Former Chief Petty Officer First Class Jim ‘Lucky’ Gordon has done just that in a series of stories and articles for the Museum of Naval History. We think you will find that Jim has a great sense of humour but never forgets the importance of the real tasks at hand. 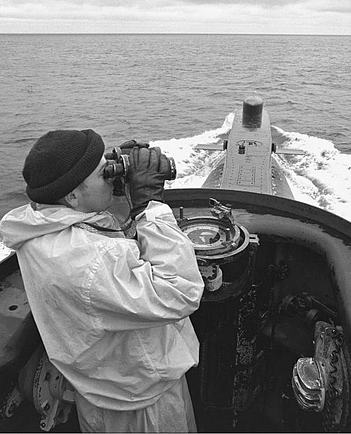 Submariners are real men doing very real jobs in incredible circumstances. Don’t let his wry humour lead you to label him a joker; he retired in 1997 as Fleet Chief Petty Officer Maritime Forces Atlantic and his long and dedicated service to Canada has been acknowledged with the Medal of Military Merit. Mike and I gathered our safety gear, climbed into the fin and shut and clipped the door. Once we could control our levity we asked for permission to carry on below. The reply was a very clear and resounding "NEGATIVE, STANDBY PERSONNEL TRANSFER, FORWARD CASING". A minute later, trying to maintain a serious air of military deportment, Mike and I were escorting the scarlet faced admiral, sporting the XO's belt, back out onto the casing as the helicopter closed in to pick him up. 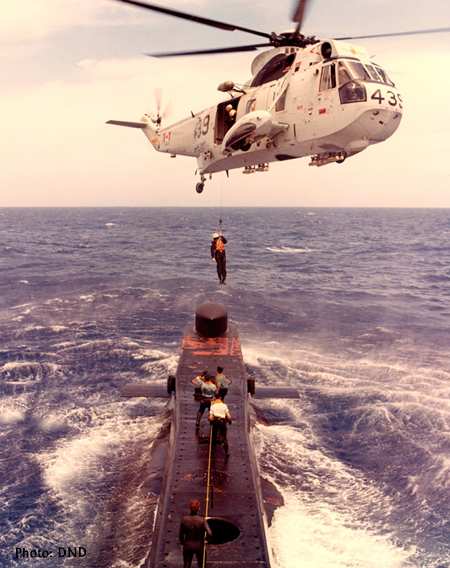 As soon as it was in reach I hooked the wire cable with my grounding rod, snapped the cable hook smartly onto the admirals horse collar and Mike raised his arm and twirled his hand to give the hoist away signal to the winch operator in the bird. Like the down of a thistle, up in the air he went, arms down holding onto the front of his pants and the XO's belt. Absolute gun drill precision now. 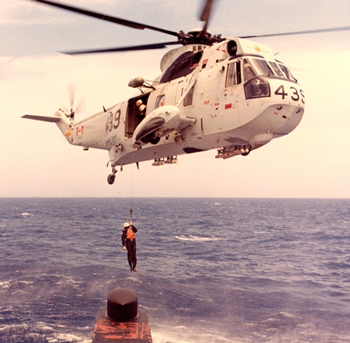 He was hoisted into the bird and it heeled and peeled away on a direct course for Shearwater Naval Air Station. As slick as a snail's trail.